MPG-o-Matic Mitsubishi Outlander XLS Review Summary: . The 2009 Mitsubishi Outlander XLS is among the most sporting of the mid-size Sport Utility Vehicles (SUV), with a rally-inspired design that provides real four-wheel-drive, magnesium paddle shifters, and an optional 650-watt Rockford Fosgate audio system. All 2009 Mitsubishi Outlander ES and SE models are equipped with a 2.0 liter 4-cylinder engine, producing 168 horsepower (HP) and 167 foot-pounds of torque. The more sporting Outlander XLS is equipped with a 3.0-liter V6, producing 220 HP and 204 foot-pounds of torque. The 2.0-liter is fitted with a CVT, while the 3.0-liter V6 earns a well-suited six-speed automatic transmission. The official mileage estimates for the V6 AWD 2009 Outlander XLS are 17 city / 23 highway miles per gallon (MPG). We put over 400 miles on the odometer of our V6-equipped Outlander XLS review unit, sneaking past the official estimates, scoring an average of 25.5 MPG on the Interstate highway, with 22.1 MPG combined. All mileage tests were performed with the drive mode selector in 2WD. Test period temperatures ranged from the twenties through the forties, with freeway speeds between 60 and 72 miles per hour (MPH). The Outlander XLS’s V6 and Sportronic six-speed transmission proved themselves to be a worthy combination. While the Outlander’s admittedly a bit removed from the venerable Mitsubishi EVO, the column-mounted magnesium paddle shifters manage to turn that everyday drive into more fun than a XBox 360. Okay, so you might not give up playing Gran Turismo. Although the Outlander can’t compare to an EVO, its handling beats the typical marshmallow SUV’s handling, hands down. And you can always bring your xBox or Playstation along with and plug it into the video input ports that come with the Navigation option package. There are three 12-volt outlets: one at the base of the dash, one in the center console, and one in the rear cargo area. A 115-volt AC outlet can be found in the console, as well. The Outlander’s standard issue Multi-Information display is located center-stage, between the tachometer and speedometer. With average fuel economy and instant MPG displays, the LED screen provides the feedback you need to get the maximum mileage out of the Outlander. MPG Tips: When driven conscientiously, the six-speed automatic Outlander can beat the numbers. The trick, as always, is to drive with a light foot and let off the throttle whenever possible. 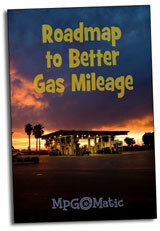 Shift early and keep the real-time MPG thermometer as high as you can, for as long as you can. Use inertia to its greatest advantage, but keep in mind that you’re in a SUV, not a sports car. The Outlander XLS features a crisply-designed, driver-focused interior, with comprehensive steering wheel controls. The luxury package include leather seating and heated front buckets, although lumbar support is notably absent. Selectable four-wheel-drive allows the driver to dial down to front wheel drive to save on fuel or up to four wheel lock for the rough stuff. The split rear tailgate provides excellent access to the Outlander’s 72.6 cubic feet of cargo space. And last but not least, the optional 650 watt Rockford Fosgate audio system delivers plenty of thump to rattle the mirrors with a 10-inch subwoofer. All-in-all, the sporty Outlander XLS offers a unique and fun-to-drive alternative to the more mundane competition. Note: The 3.0-liter SOHC MIVEC V6 qualifies as a Partial Zero Emissions Vehicle (PZEV).